This step-by-step polymer clay tutorial explains how to create delicate designs using metal leaf, alcohol inks, and metal filigree. The technique is demonstrated with three projects: a pendant, a pair of earrings, and a bracelet. 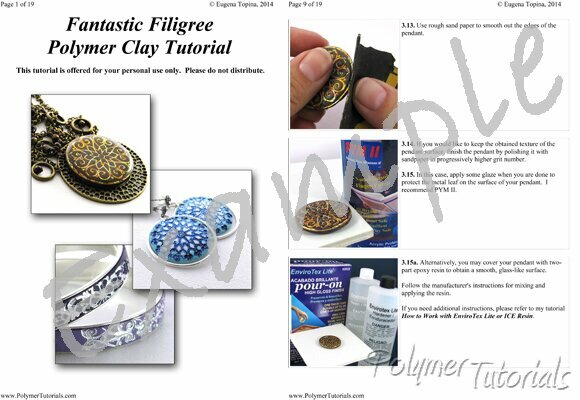 The first three pictures on this page show the projects described in this tutorial, and the last picture shows a variation of this technique. Place a mouse over the small pictures to see them enlarged. If desired, a flat jewelry piece done in this technique may be finished with two-part epoxy resin. Note: If you need instructions for working with two-part epoxy resin, please refer to my detailed step-by-step tutorial How to use EnviroTex Lite or ICE resin.